a.k.a. DJ AFOS: A Blog by Jimmy J. Aquino: "Rock Box" Track of the Day: The Pogues, "The Body of an American"
"Rock Box" Track of the Day: The Pogues, "The Body of an American"
"On its surface The Wire is a cop show, the most stereotype-ridden of TV genres, yet nowhere in The Wire do stereotypes exist. There are no good guys and bad guys, merely men and women who work on opposites sides of the socially acceptable. The Wire treats both as people caught up in the same racial, class, and political tensions that afflict any American, and dramatizes them in manners that feel natural. It's why you're not surprised that African-American detective Lester Freamon knows the words to the Pogues' 'Body of an American' when it's played at a cop wake in an Irish bar." Why's it part of the "Rock Box" playlist? : When Robert F. Colesberry, a co-executive producer of my favorite TV series of all time, The Wire (as well as an occasional actor who appeared on The Wire as homicide detective Ray Cole), died of complications from heart surgery in 2004, series creator David Simon had Colesberry's character die off-screen, and in the "Dead Soldiers" episode, he paid tribute to his mentor and friend through a heartfelt and rousing scene in which a bar full of white and African American Baltimore cops holds an Irish wake for Detective Cole. "I started listening to a lot of different music for this scene, and The Pogues just naturally came into it, and 'Body of an American,' which seems to tell its own story in its own way about life and about loss, just became this thematically perfect thing," said Simon during his "Dead Soldiers" audio commentary. "The idea that [Baltimore detectives] would lay a guy out on the pool table and do a detective's wake and then sing this song seems entirely reasonable. They don't have this tradition, but they should." The Shane MacGowan-penned gem, which is about a wake for an Irish boxer-turned-soldier, a real-life prizefighter named Jim Dwyer, "the man of wire," was reprised twice more on The Wire: when the "Corner Boys" episode paid tribute to another deceased Wire cast member, Richard DeAngelis, by giving his cop character Raymond Foerster a sendoff similar to Cole's and when a fake wake was held for Jimmy McNulty (Dominic West), a comedic highlight of the series finale "-30-." The eulogy that Sergeant Jay Landsman (Delaney Williams) gave for Cole was filled with references to past Colesberry projects like Mississippi Burning, After Hours and Simon's HBO miniseries adaptation of his own book The Corner. 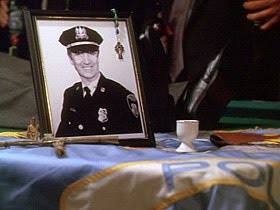 When Landsman delivered his fake eulogy for McNulty, his lines about McNulty's disregard for rules and authority could double as a comment on what The Wire itself accomplished as a TV series and an exploration of "a dark corner of the American experiment" during its extraordinary five-season run: "He was the black sheep, a permanent pariah... He did what he wanted to do, and he said what he wanted to say, and in the end, he gave me the clearances." The Heavy, "Short Change Hero"
Death from Above 1979, "Romantic Rights"
The Bar-Kays, "Too Hot to Stop"
This is the final "'Rock Box' Track of the Day" post. The "Rock Box" block on A Fistful of Soundtracks airs 4-6am, 9-11am and 3-5pm on Mondays and 5-7am, 9-11am and 3-5pm on Fridays. "Rock Box" Track of the Day: Geto Boys, "Still"
"Rock Box" Track of the Day: Cameo, "Candy"